If using live lobsters, In a large kettle of boiling salted water plunge the lobsters, head first, and boil them, covered, for 8 minutes from the time the water returns to a boil. In the meantime, prepare an ice bath large enough to accommodate all the lobsters. Transfer the lobsters with tongs to the ice bath for a couple of minutes and then to a cutting board and let them cool until they can be handled. Break off the claws at the body and crack them. Remove the claw meat and cut it into ½ inch pieces. Halve the lobsters length-wise along the undersides, remove the meat from the tails, discarding the bodies, and cut it into ½ inch pieces. In a heavy saucepan cook the lobster meat and shallot in the butter over moderate heat, stirring occasionally, for 2 minutes, add 2 tablespoons of the Sherry and 3 tablespoons of the brandy, and cook the mixture, stirring, for 2 minutes. Transfer the lobster meat with a slotted spoon to a bowl. Add the cream to the Sherry mixture and boil the mixture until it is reduced to about 1 cup. Reduce the heat to low and stir in the remaining 1 teaspoon Sherry, the remaining 1 teaspoon brandy, the nutmeg, the cayenne, and salt to taste. Add some of the cream mixture to the egg yolks to temper them. Slowly pour the yolk cream mixture back into the sauce, cook the mixture, whisking constantly, and cook it on low heat, whisking, for 3 minutes more or until the sauce is thick. Be careful not to let the sauce come to a boil. 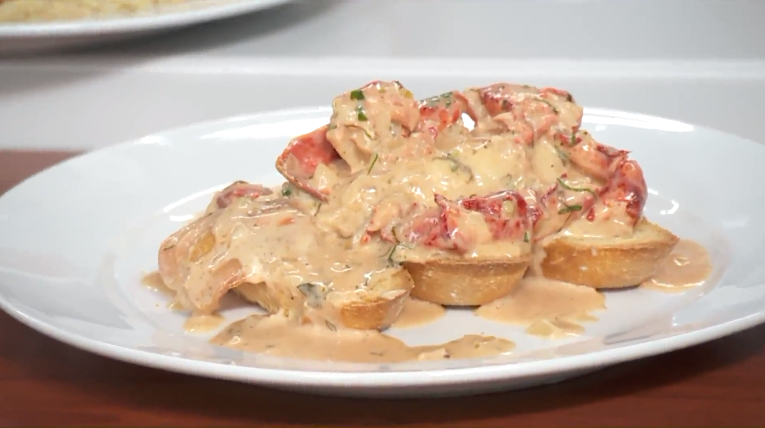 Stir in the lobster meat and serve over slices of toasted baguette.